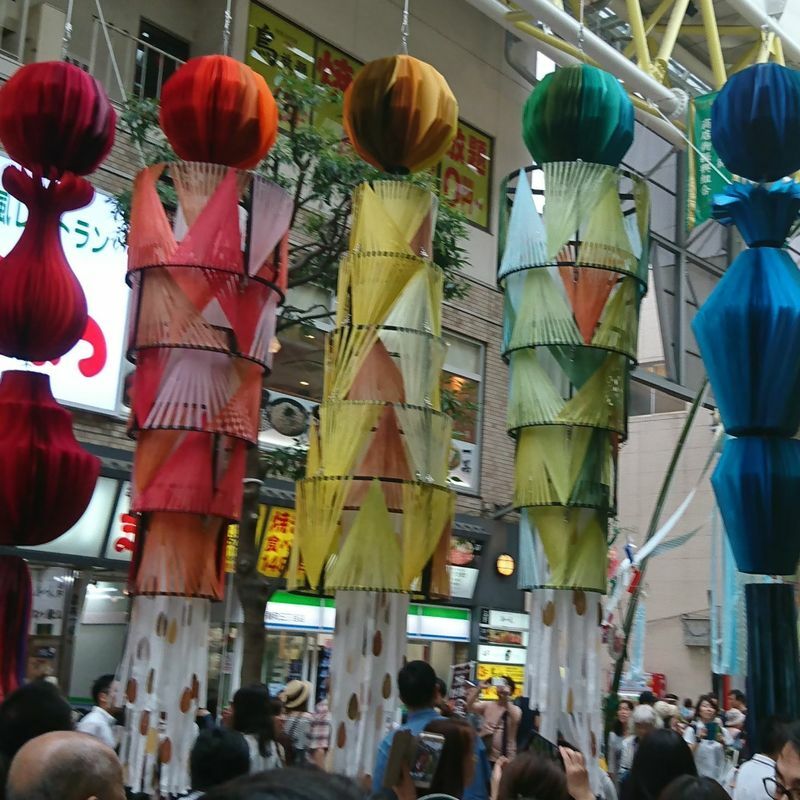 Tanabata, the star festival that is celebrated in most parts of Japan back in July, makes a big statement in Sendai, but is it worth the trip to the largest city in Tohoku just to see some massive paper streamers, especially if that trip is just hours before a typhoon is set to arrive? In my opinion, yes. As Miyagi residents, this trip only costs us a few hundred yen, so it is easy to say that the festival atmosphere and food is worth the transit fee. For out of towners, especially coming up from Tokyo or other large cities, Sendai may seem less crowded and humid by comparison, making for a nice little break in the harshness of Japanese summer. Even if a typhoon should threaten the event, the decorations are hung under the covered walkways of the shopping arcade, so one can enjoy them even in rain or wind and only have to confront the weather to cross the street. We went on the last day of the festival and the decorations were still breath taking and lovely. At one point, I was approached by a young Japanese man from a tourism organization in Sendai. In addition to giving me a helpful pamphlet in English as well as some "Enjoy Sendai" pins, he asked a few questions about how we got there and what we liked about the festival. To his surprise, I mentioned the lack of a parade. Apparently most foreigners are disappointed by the fact that there isn't a day-long reason to stand in direct sunlight, trying not to get heat stroke. There are festivals in Sendai that specialize in parades and floats and dancers, but this one is more of a choose-your-own-adventure. Visitors move at their own pace through the streets, stopping where they like, popping into a shop or two if the need strikes, and generally having their own good time. I prefer it hands-down to the other kind of festival. Without scheduled events, the festival can be enjoyed regardless of weather or timing. Show up some time during the day and you'll have drinks, food, and games outlining the path down the decorated arcade. Though the decorations usually have similar shapes and sizes, they are each designed and created especially for the year that they appear. Walking through the shopping arcade, you can see the details of the paper up close and admire what some have written or folded or crocheted. How the things come together is interesting, but for me it's also seeing what has changed over the years. Some have evolved and become more intriguing, the best example of which this year being the kamaboko shop's interstellar display. Unique among the group this year, the decorations here tend to focus on folding and manipulation of paper to create an almost architectural design. A poster attached to the bamboo that held the decorations aloft explained the design in English and Japanese. Another eye-catcher was the rainbow of cranes at the three-way crossroads between the arcades, near Fujisaki. One couldn't help but snap a quick picture in front of it. Many other decorations focused on the shop they represented, such as the zunda shop utilizing many a soybean in their design or JAL sponsoring the decorations outside a travel agency. Eddie Bauer and Starbucks used logos from their companies on more generic looking steamer creations. Maybe to some, just these massive decorations, their textures paper and cloth, their details and design are not enough. To these unimpressed folks, I suggest checking out this website for more information on the various festivities, which thisyear included included a bamboo lantern display at Zuihouden, the Date clan's beautiful mausoleum, featuring flute accompaniment. Samurai were also a key feature at the Sendai Castle site, where performances by the Date Bushoutai Samurai Warrior Group likely thrilled the crowd. Unfortunately, we had no idea about any of these supporting events and had exhausted ourselves in our walk along the arcade. As the wind picked up, it was clearly time for us to head home. If you're free August 6-8 of next year, check out Sendai's Tanabata Festival. It's well worth the trip.